From charming little dish gardens to succulent terrariums, give an exotic touch to your living room table with these gorgeous collection of miniature garden by Cute Shoots. Brainchild of Smita Pandya, Cute Shoots at Bhagirathi Bungalow, off SB Road, is perhaps Pune’s first ever nursery of fairy gardens and terrariums. 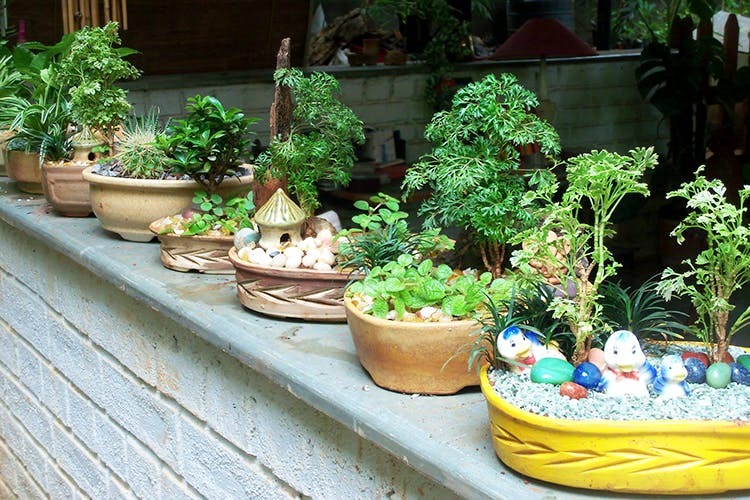 Starting at INR 1,500 for a small terrarium, Smita’s wide variety of designs will spoil you for choices. From a crafty little bonsai park on a dish to a colorful assortment of dwarf plants and rare stones inside a mason jar, Cute Shoots has that perfect center-piece for your patio! From closed to open pieces, these miniature gardens are self-sustainable. Meaning? They require minimum maintenance. Water them once a month, and you’re good to go! While Cute Shoots has everything you need – a lush green moss garden on a curvy plate, a bromeliad landscape with pebbles inside a glass vase, an assortment of aloe, jade and cacti in an oval aquarium – you can also get a customised terrarium made by Smita. You can also learn how to make terrariums and dish gardens at Cute Shoots! Smita conducts workshops for kids and adults. All you have to do is follow the Facebook page for update. Give a beautiful makeover to your work station or living room with miniature gardens and terrariums by Cute Shoots.